As the summer is in full swing, we've been enjoying more and more light meals using fresh produce, olive oil and a lot of lemon. This salad is a great Italian classic, featuring a whole lot of veggies and some crusty bread. These crusty cubes of bread are tossed with tomatoes, cucumbers and red onions and then drizzled with a citrusy vinaigrette. The bread soaks up all the flavors of the salad and makes for a hearty dish that can be used as a main meal. When I made my way to the farmer's market a few days ago, I was looking for those beautiful heirloom tomatoes that are so succulent during the summer months. The more uneven the shape, unstructured the edges and different variations in color make for the best tomatoes, in my book. Supermarkets make us think that fruit and vegetables should be shiny, symmetrical and perfectly round but that is definitely not the way nature intended it. Getting my hands on a batch of yellow, orange, red and crimson tomatoes always makes my heart swing. To tell you the truth, I often just end up having them thinly sliced with extra virgin olive, cracked black pepper and fleur de sel - but this salad really took these to the next level. We have moved to Toronto for most of the summer, and found this incredible little bakery in our neighborhood. I got their signature sourdough walnut bread - which worked wonders in this salad. What meals have you been enjoying in this scorching heat? Drizzle the bread slices with a little olive oil and set in a warm oven until crusty. Peel the garlic clove and cut in half. Rub the garlic on the warm bread. Cut the bread into cubes (the same size as the vegetables) and set aside. In your serving bowl, add the tomatoes, cucumber, red onion, olives and feta. Toss in the bread cubes. In a small bowl, add the olive oil, lemon juice and red wine vinegar. Add a good pinch of salt and pepper and lightly whisk. Drizzle over the salad and serve. Enjoy! Ah yes, as little cooking as possible in the current heat is definitely the thing to do! I love this panzanella...! What a beautiful photo of your panzanella salad. Wow and double wow. Cookbook worthy. I love panzanella, only trouble is, when no one is looking, I pick out the bread and only eat it. Shame on me. Breathtaking photography as always :) We're having insane unprecedented weather here in singapore; with humidity one moment, and thunderstorms the next. I just keep things simple with snack cakes to keep the spirits high! I just made Panzanella salad to accompany steak for dinner the other night.. such a wonderful summer salad! It's almost a meal all by itself! I just made this for dinner too! I guess with all the tomatoes all over the place, we are all thinking along the same lines. :) Great picture, as always! i LOVE this as a meal. Gorgeous photo! using sourdough bread is the best, especially when it soaks up all those flavors. I've always wanted to try panzanella, I don't know what is stopping me. Your photo makes it look incredibly delicious! 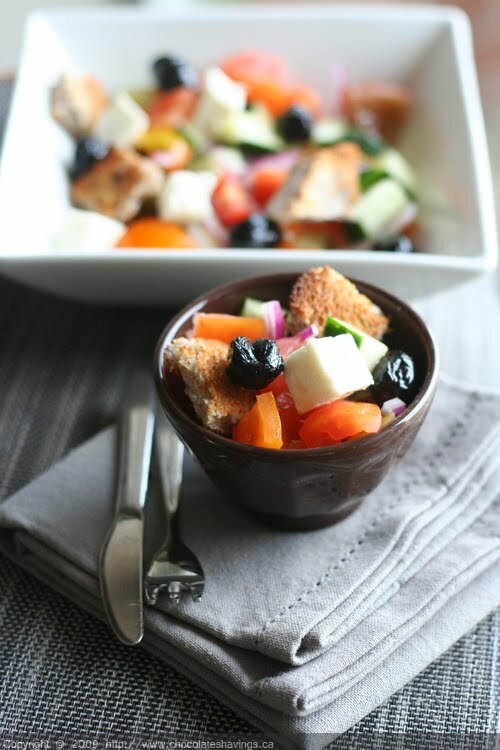 I love panzanella salad, and yours looks just perfect. And I agree about the heirloom tomatoes. Can't wait to try your recipe. my dad would say you like 'real' tomatoes... that is, they don't have to be pretty to be tasty, at all. You won't believe me, Jen, but I have never tried a panzanella salad - this is beautiful! Patricia Scarpin: You should definitely give it a try if you can - it's really a great salad for the warm summer months!